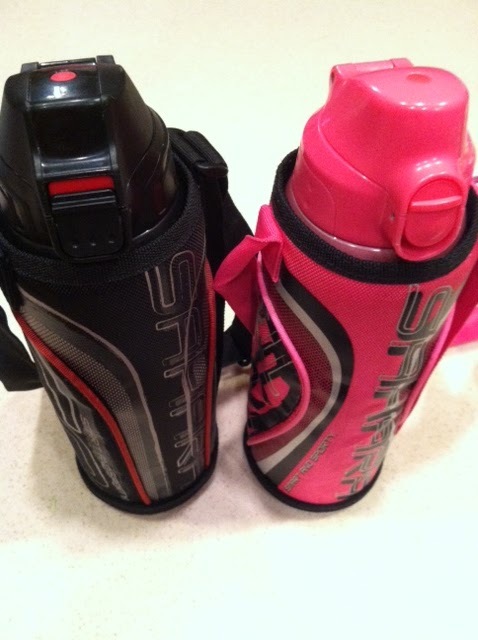 The Helpful Home: Tiger sports water bottle-best ever!! Cold and refreshing water on the go! Dry skin? Headaches? Tired? Want to lose weight? Seems the answer is always, "drink more water!" (It's like how "stress" seems to be the cause of many health issues...but that's another post.) Okay...I drink water...and I think I drink a lot of it--but I get busy, drink half of a cup, forget about the cup, so I use another cup...and over the course of the day, I really don't know how much water I've consumed. Plus, I hate it when the ice melts and the condensation goes all over the place. Then I have to dump out the cup, and start all over again. Too...much...effort. It's the Tiger brand sports bottle. It has a pop-top lid, with lock closure. It even comes with a holder with strap! I bought the 1.0 liter size, but there are smaller versions too. Now, I always have cold water ready to drink, and I can keep track of how much water I'm consuming throughout the day! Note: Tiger makes a 2-way version, that comes with a cup on top. I didn't buy that one because it wasn't as convenient to drink from the bottle. where can I possbibly buy this for my daughter? Thank you! Or if your city has an Asian marketplace, one of the stores may carry the brand.